Wel a3te we is day holde 3if we were wel understonde. þat we to þe joie come to wan oure Louerd us bo3te. Well ought we to keep his feast-day, if we well understand. 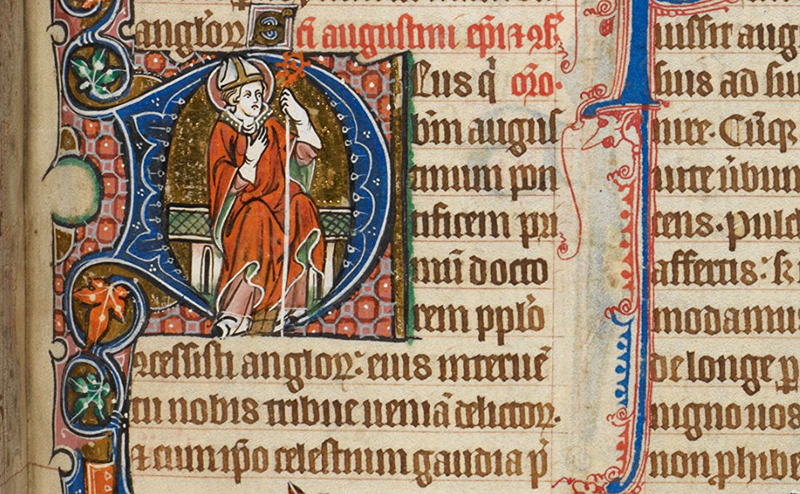 May 26, as this Middle English Life of Seint Austin (in the South English Legendary) tells us, is the feast of St Augustine of Canterbury. 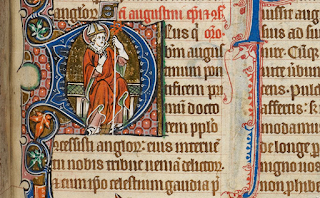 St Augustine, 'apostle of the English', first archbishop of Canterbury, led the mission sent by Gregory the Great from Rome to convert the English, and died on 26 May in 604. In this post are some extracts from medieval texts dealing with St Augustine, from throughout the medieval period - just a small sample, illustrating the central place of Augustine's mission in the story of English Christianity. This is the church of St Martin, the oldest church in England still in use (for more images see this post). 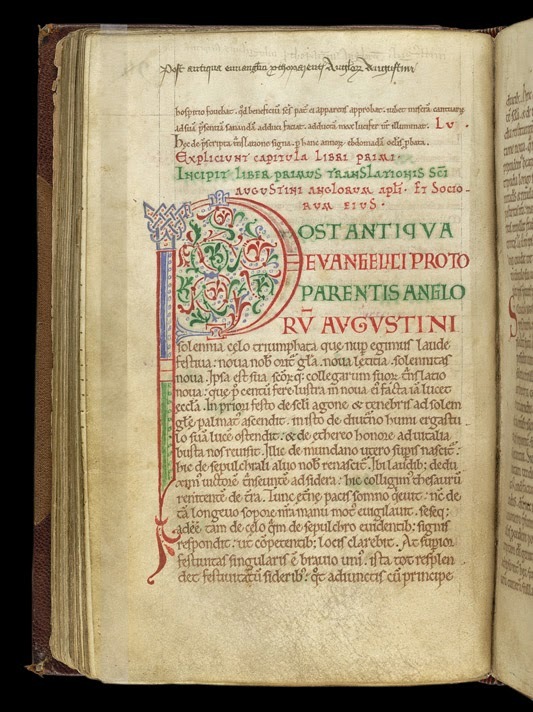 When Augustine died in 604 he was buried in the monastery he had established in Canterbury, which became known by his name. For more on St Augustine's, its glorious history and evocative ruins, see this post. On ðam dagum rixode Æþelbyrht cyning on Cantwarebyrig riclice, and his rice wæs astreht fram ðære micclan ea Humbre oð suð sæ. Augustinus hæfde genumen wealhstodas of Francena rice, swa swa Gregorius him bebead, and he, ðurh ðæra wealhstoda muð, þam cyninge and his leode Godes word bodade: hu se mildheorta Hælend, mid his agenre ðrowunge, þysne scyldigan middaneard alysde, and geleaffullum mannum heofonan rices infær geopenode. Þa andwyrde se cyning Æðelbriht Augustine, and cwæð, þæt he fægere word and behat him cydde, and cwæð, þæt he ne mihte swa hrædlice þone ealdan gewunan ðe he mid Angelcynne heold forlætan; cwæð þæt he moste freolice ða heofonlican lare his leode bodian, and þæt he him and his geferan bigleofan ðenian wolde; and forgeaf him ða wununge on Cantwarebyrig, seo wæs ealles his rices heafod-burh. 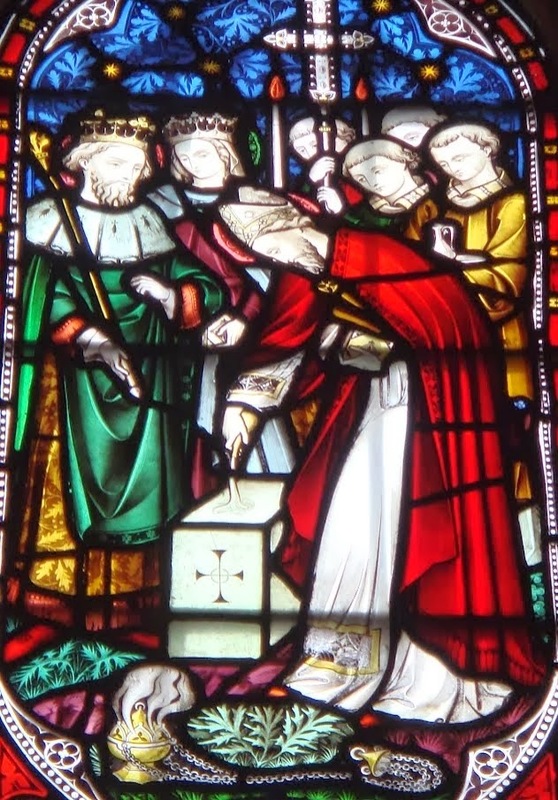 Ongann ða Augustinus mid his munecum to geefenlæcenne þæra apostola lif, mid singalum gebedum and wæccan and fæstenum Gode ðeowigende, and lifes word þam ðe hi mihton bodigende, ealle middaneardlice ðing swa swa ælfremede forhogigende; ða þing ana þe hi to bigleofan behofedon underfonde, be ðam ðe hi tæhton sylfe lybbende, and for ðære soðfæstnysse ðe hi bodedon gearowe wæron ehtnysse to ðoligenne, and deaðe sweltan, gif hi ðorfton. 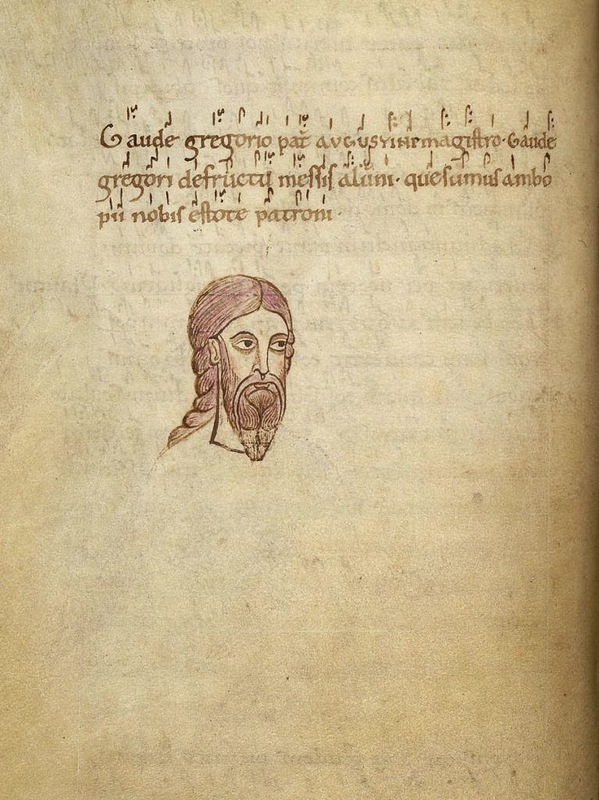 Augustinus gesette æfter ðisum biscopas of his geferum gehwilcum burgum on Engla ðeode, and hi on Godes geleafan ðeonde ðurhwunodon oð ðisum dægðerlicum dæge. This follows Bede so closely that I won't translate it (I just thought you might like to see the story in Old English!) but the final sentence here reads "After this, Augustine established from among his companions bishops over all the cities of the English people, and they have continued flourishing in the faith of God up to this present day". This sense of unbroken continuity is central to later interpretations of Augustine, as we shall see again. &, ut hanc sciret, indidit. who in his surpassing mercy brought the human race back to life and taught it to know that life, when he crushed Hell. he sent out his son, not by the seed of the flesh, but by spiritual growth, to bring the glory of Christ to fierce nations. As soon as he has carried that out with all effort and with the help of God, he is summoned from the vaults of heaven to share there the joy of the angels. Therefore we suppliants pray to you, excellent maker of created things, to give your humble servants what is yours according to the speech of this your soldier. Glory and splendour be to the Father and perpetual light be to the Son. Glowing beauty be to the Spirit that proceeds from them. When Seynt Austyne come ferst into Engeland, he arryuede in þe Ile of Tenet, and so passede fourth, & come vnto Kaunterbery, and þere soiournede. 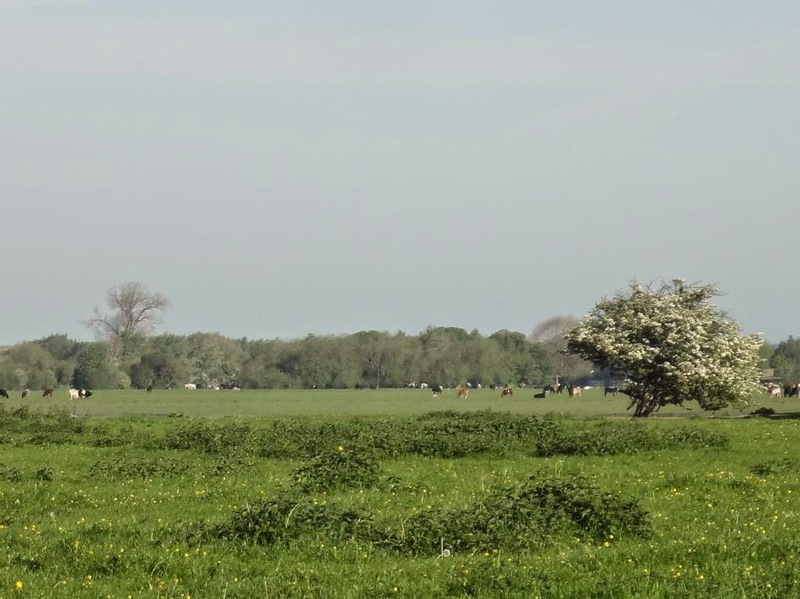 And Kyng Adelbright of Kent, þat was of þe lynage of Engist, faire vnderfong seynt Austyn & his felowes wiþ michel honour, & ham fonde al þat ham nedede; & ferþermore he 3af ham a faire place þat now is callede þe Abbay of seynt Austynus, in whiche place he liþ himself shrinede. This Kyng Adelbright was a gode man, and wiþ godewel herde seynt Austynus predicaciouns, and 3af him leue to preche þrou3 al his lande of Kent, to tourne & to conuerte to him al þe peple þat he mi3t. 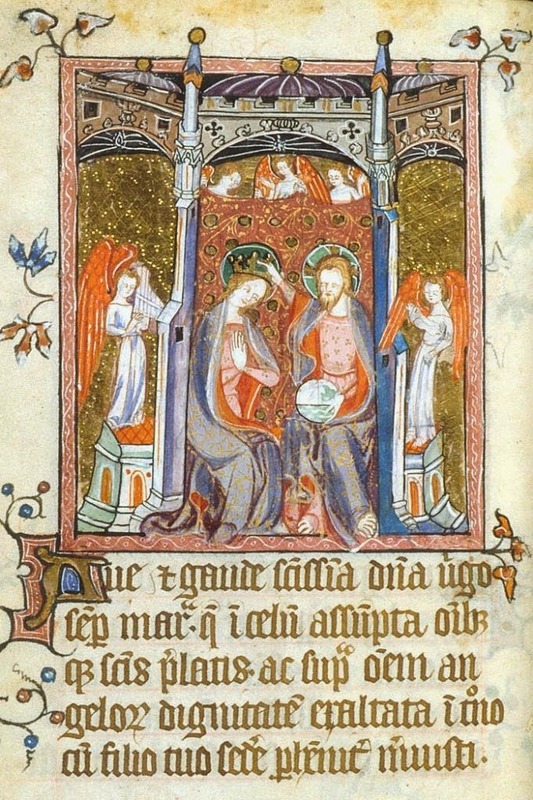 Hit bifelle so afterwarde, þrou3 Goddes grace, þat in litel tyme þe kyng himself was conuertede to Gode, and all his peple of his lande was baptisede. 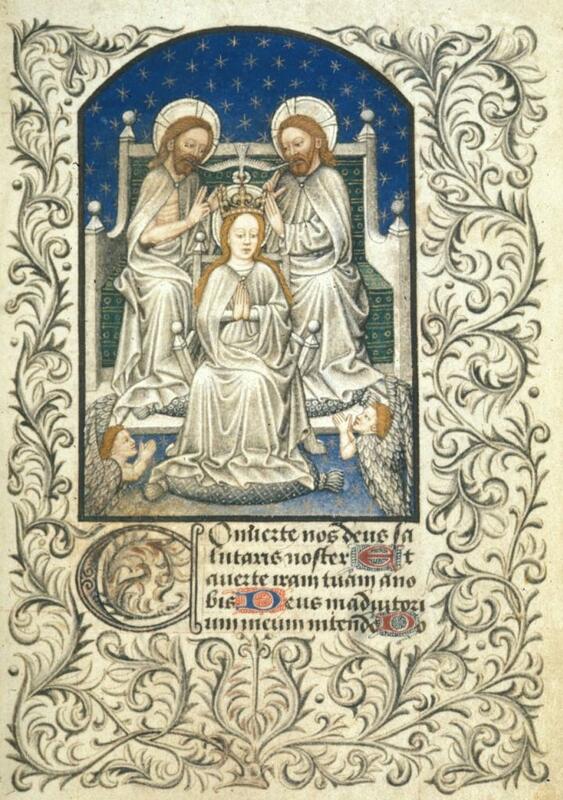 And in the menewhile þat þe peple turnede ham to God, seynt Austyn come to Rochestre, and þere prechede Goddes worde. þe paynemys þerfor him scornede, and caste on him righe tailes, so þat al his mantel was hongede ful of righe tailes; and for more despite þai caste oppon him þe guttes of ryghe & of ffisshe; wherfore þe gode man seynt Austyn was sore agreuede, and prayede to God þat alle þe childerne þat shulde bene borne afterwarde in þat citee of Rouchestre moste haue tailes. By his moost hooly conversacioun. Thoruh al this land to make his liht appeere. Was trewe Auriga of foure gospelleeris. Lyk ydolastres blyndid in our siht. Tavoyde away our froward mescreaunce. In coold watir by hym we wer baptised. This poem was written nearly a thousand years after St Augustine landed in Kent, but the sense of continuity is as strong here as in Bede, and in the Life of St Austin's assertion that Augustine "to Cristendom us bro3te": it was "this land" to which Augustine came; until his coming "we slumbered in darkness", and "by him we were baptised". 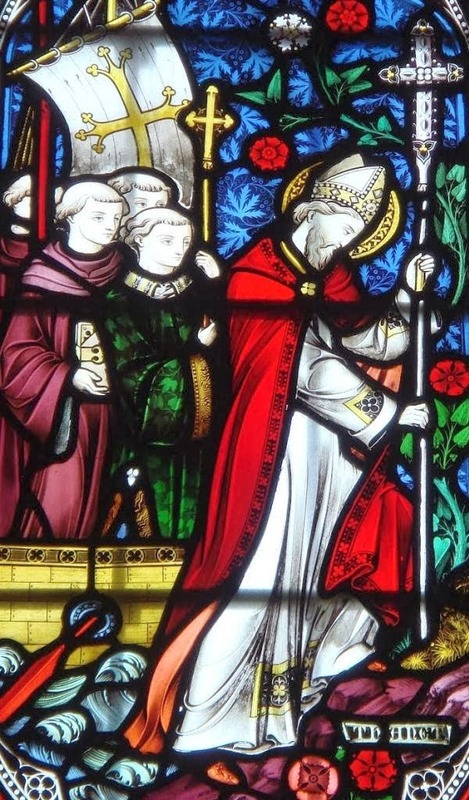 Today is the feast of St Dunstan, one of the greatest saints of Anglo-Saxon England - statesman, archbishop of Canterbury, scholar, monk, musician, metal-worker, and noted tormenter of devils. The multi-talented Dunstan, who died on 19 May 988, is a fascinating saint for a number of reasons: an influential figure in a formative period for the Anglo-Saxon church and state, adviser to successive kings and credited with a leading role in the tenth-century monastic revival, he was also for centuries after his death a genuinely popular saint in England and beyond. Two years ago I wrote a series of posts with my seven favourite stories about him, starting here (and it was hard to narrow it down to seven! ); there you can read about Dunstan's skill in metal-working and music - and magic (alleged) - as well as his various encounters with the devil and posthumous miracles. This is a hymn to St Dunstan for use on his feast-day, which was probably composed at Canterbury early in the eleventh century. et ad deum dux praevie. adsit nobis in secula. Amen. Hail Dunstan, star and shining adornment of bishops, true light of the English nation and leader preceding it on its path to God. You are the greatest hope of your people, and also an innermost sweetness, breathing the honey-sweet fragrance of life-giving balms. In you, Father, we trust, we to whom nothing is more pleasing than you are. To you we stretch out our hands, to you we pour out our prayers. Your sheep, holy shepherd, are oppressed by troubles on all sides. See how we Christians are being slaughtered by the swords of the pagan nation! Offer, O priest, the sacrifice to Christ of most welcome prayers, so that by them he may be appeased and release us from the iron fetters of our transgressions. Through them may heathen peoples and harmful diseases depart from the lands of the English and the sons of the church. Through you may the Father, our only hope, through you may the Son, our only peace, and the Spirit, our only light, be with us forever. Amen. In the manuscript, the 'Durham Hymnal' (Durham Cathedral, B.III.32), this hymn has an Old English gloss, which tells us that Dunstan is, among other things, a 'tungel 7 wlite scinende biscopa' and an 'arfæsta heorde', 'orþiende wyrtbræþa swetnyssa, liflicra hunigswete'. It seems likely that the 'swords of the pagan nation' (swurde þeode hæþenre) mentioned in the fourth verse are neither hypothetical nor hyperbolic; they must be the swords of the Danes, who were pressing close on Canterbury and the whole of England in the first decade of the eleventh century. 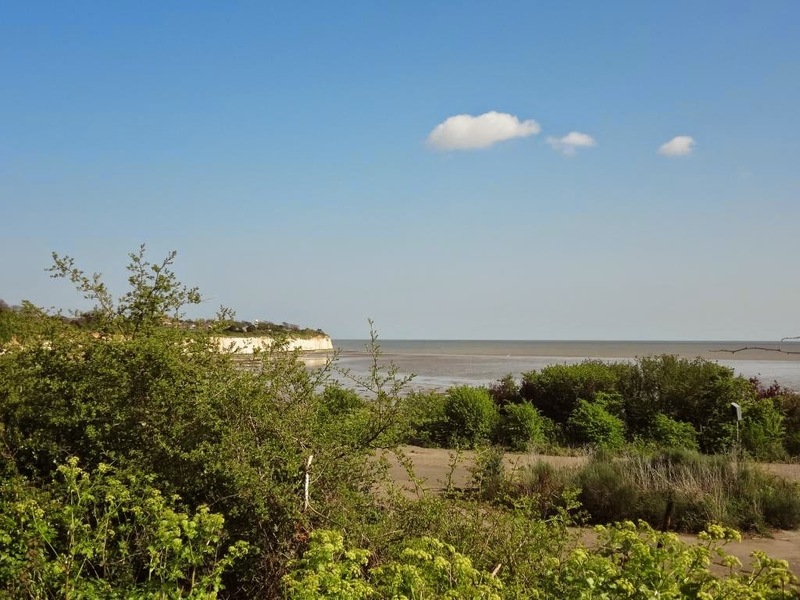 Archbishop Dunstan had lived through a few decades of respite from Viking attacks on England, but the last years of his life saw a return of raiding along the sea-coast, which was to increase in intensity, and spread further inland, in the years following his death in 988. In those years the first Lives of Dunstan were composed, along with this hymn and a number of prayers to England's newest saint. We could probably picture the monks of Canterbury singing this hymn on St Dunstan's day 1011, not knowing that within a few months the Danish army would occupy and burn the city itself, and capture and kill Archbishop Ælfheah. 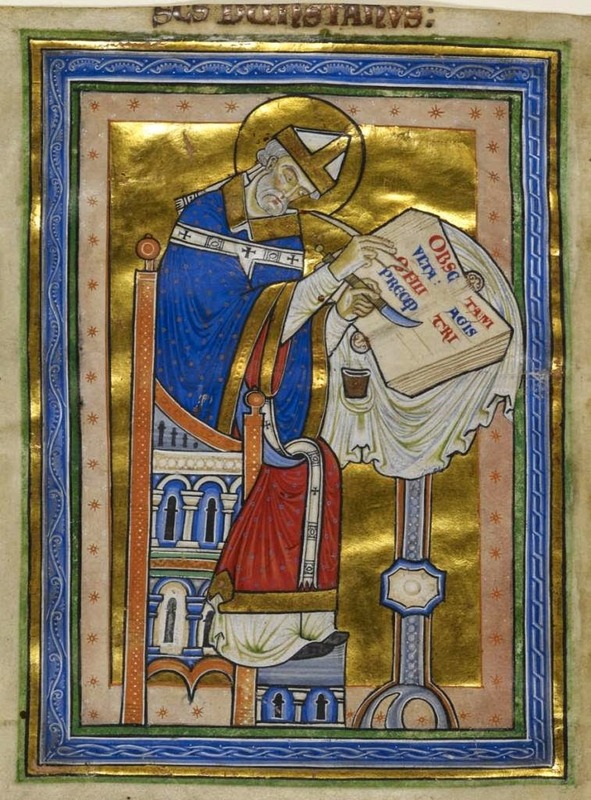 Ælfheah had been a protégé of St Dunstan, and strenuously promoted his cult at Canterbury, so this hymn may well have been written at his instigation. This context adds great poignancy to the hymn: never had Dunstan's sheep had greater need of their shepherd's prayers. This song would be sung at Compline, after the last service of the day, and it has a lilting and melodious chant, with all the sweet simplicity of a lullaby. Listen to it here. Ryman's carol borrows just the first two lines and meditates upon them, inverting them to form a macaronic refrain which weaves its way through the poem. The text comes from here, and my translation follows. This is a finely balanced poem, elegantly constructed. Each verse in turn presents us with a pair of evenly matched titles: emperor and empress, king and queen, prince and princess, lord and lady, mother and son. Notice how perfectly the Latin and English lines fit together: every first line offers an address to Mary and then a title for Christ to which the relative pronoun of the refrain, quem, can refer. In every verse the first three lines provide a cause of joy which leads up to the fourth line's imperative, lætare - as if to say 'and so for that reason, be glad'. And you hardly notice how well it works, because the effect is so lovely. An extract from Part 6 of Ancrene Wisse, the thirteenth-century book of guidance for anchoresses. Vilitas & asperitas, vilte & asprete, theos twa, scheome & pine, as Sein Beornard seith, beoth the twa leaddre-steolen the beoth up iriht to heovene; & bitweone theose steolen beoth of alle gode theawes the tindes ifestnet, bi hwucche me climbeth to the blisse of heovene. Forthi thet Davith hefde the twa steolen of this leaddre, thah he king were, he clomb uppard & seide baldeliche to ure Laverd, Vide humilitatem meam & laborem meum & dimitte universa delicta mea. "Bihald," quoth he, "& sih min eadmodnesse & mi swinc, & foryef me mine sunnen alle togederes." Notith wel thes twa word the Davith feieth somet: "swinc" ant "eadmodnesse" - swinc i pine & i wa, i sar & i sorhe; eadmodnesse ayein woh of scheome thet mon dreheth, the is itald unwurth. "Ba theos bihald in me," quoth Davith, Godes deorling. "Ich habbe theos twa leaddre-steolen." Dimitte universa delicta mea. 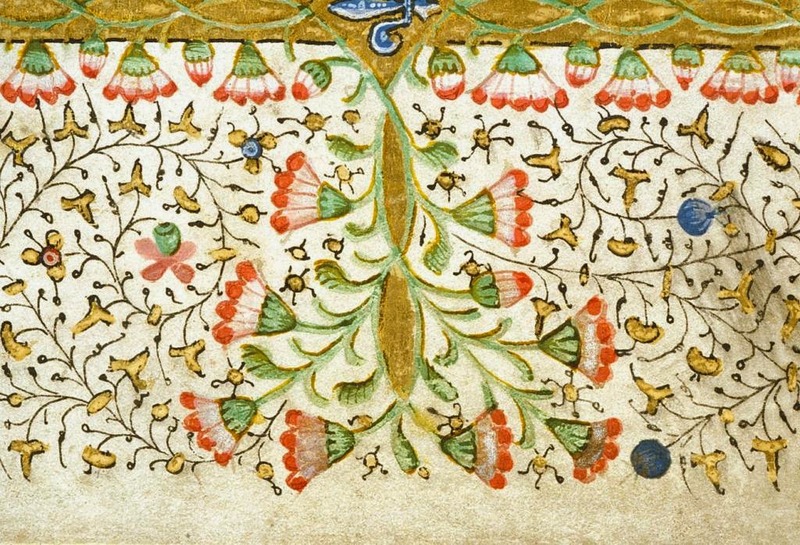 "Leaf," quoth he, "bihinde me & warp awei from me alle mine gultes thet ich, ilihtet of hare hevinesse, lihtliche stihe up to heovene bi theos leaddre." Theose twa thinges - thet is, wa & scheome ifeiet togederes - beoth Helyes hweoles the weren furene, hit teleth, & beren him up to parais, ther he liveth yetten. Fur is hat ant read. I the heate is understonden euch wa thet eileth flesch; scheome bi the reade. Ah wel mei duhen. Ha beoth her hweolinde, ase hweoles overturneth sone, ne leasteth nane hwile. This ilke is ec bitacnet bi cherubines sweord bivore paraise yeten, the wes of lei & hweolinde & turninde abuten. Ne kimeth nan into parais bute thurh this leitinde sweord, the wes hat ant read, & in Helyes furene hweoles - thet is, thurh sar & thurh scheome, the overturneth tidliche, & agath sone. Ant nes Godes rode with his deore-wurthe blod irudet ant ireadet, forte schawin on him seolf thet pine & sorhe & sar schulden with scheome beon iheowet? Nis hit iwriten bi him, Factus est obediens patri usque ad mortem, mortem autem crucis - thet is, "he wes buhsum his feader, nawt ane to death, ah to death o rode"? Thurh thet he seide earst "death" is pine understonden. Thurh thet he threfter seith "death o the rode" is schendlac bitacnet, for swuch wes Godes death o the deore rode, pinful & schentful over alle othre. Hwa se eaver deieth ine Godd & o Godes rode, theos twa ha mot tholien: scheome for him & pine. Scheome ich cleopie eaver her beon itald unwurth, & beggin as an hearlot, yef neod is, hire liveneth, & beon othres beodesmon - as ye beoth, leove sustren - & tholieth ofte danger of swuch otherhwile the mahte beon ower threal. This is thet eadi scheome thet ich of talie. Pine ne truketh ow nawt. I theos ilke twa thing thet al penitence is in, blissith ow & gleadieth, for ayein theos twa ow beoth twafald blissen iyarket: ayein scheome, menske; ayein pine, delit & reste buten ende. Ysaias: In terra inquit sua duplicia possidebunt. "Ha schulen," seith Ysaie, "in hare ahne lond wealden twavald blisse ayein twavald wa thet ha her dreheth." "In hare ahne lond," seith Ysaie, for alswa as the uvele nabbeth na lot in heovene, ne the gode nabbeth na lot in eorthe. Super epistolam Jacobi: Mali nichil habent in celo; boni vero nichil in terra. In hare ahne lond ha schulen wealden blisse, twafald cunne mede, ayein twavald sorhe, as thah he seide, Ne thunche ham na feorlich, thah ha her tholien as in uncuth lond & in uncuth eard, bituhhen untheode, scheome ba & sorhe, for swa deth moni gentil mon the is uncuth in uncuththe. Me mot ute swinken: ed hame me schal resten, ant nis he a cang cniht the secheth reste i the feht & eise i the place? Milicia est vita hominis super terram. "Al this lif is a feht," as Job witneth. Ah efter this feht her, yef we wel fehteth, menske & reste abit us ed hame in ure ahne lond - thet is, heoveriche. Vilitas et asperitas, contempt and adversity, these two, shame and suffering, as St Bernard says, are the two uprights of the ladder which is raised up to heaven; and between those uprights the rungs are fastened, made from all good virtues, by which one climbs to the joy of heaven. 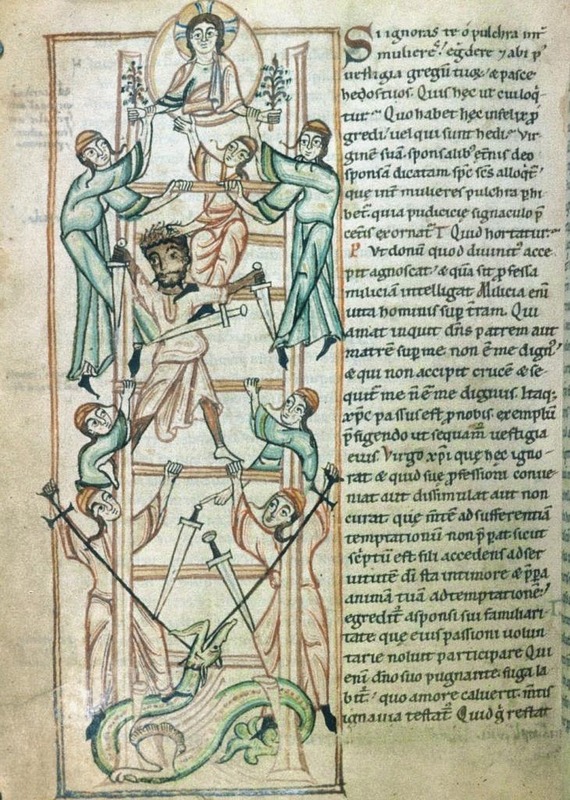 Because David had the two uprights of this ladder, though he was a king, he climbed upward and boldly said to our Lord, Vide humilitatem meam et laborem meum et dimitte universa delicta mea. "Look," he said, "and see my humility and my labour, and forgive me all my sins." Observe well these two words which David joins together, labour and humility: labour, in pain and in grief, in suffering and in sorrow; humility, in the face of the injury of shame that a man endures who is considered to be worthless. "Behold both of these in me," said David, God’s darling; "I have the two uprights of the ladder." Dimitte universa delicta mea. "Put behind me," he said, "and cast away all my offences from me, so that lightened from their weight I may lightly rise up to heaven by this ladder." Those two things, that is, pain and shame joined together, are Elijah’s wheels, which were made of fire, it is said, and carried him up to Paradise, where he still lives. Fire is hot and red. By the heat may be understood every pain which afflicts the flesh; by the redness, shame. This will serve the present purpose. Here they are temporary, just as wheels revolve quickly and do not remain in one place for long. The same thing is also betokened by the sword of the cherubim before the gates of Paradise, which was made of flame, wheeling and turning about. No one ever came in to Paradise except through this flaming sword which was hot and red, and through Elijah’s fiery wheels, that is, through suffering and shame, which turn again in time and soon pass away. And was not God’s cross ruddied and reddened by his precious blood, in order to show that mortification, suffering and sorrow should be coloured with shame? Is it not written about him, Factus est obediens patri usque ad mortem, mortem autem crucis, that is, "he was obedient to his father not only to death, but even to death on a cross"? When he said "death" first, it is to be understood as suffering; when afterwards he said "death on a cross", that betokens ignominy; for such was God’s death on the dear cross, painful and shameful above all others. Whoever dies in God and on God’s cross, these two he must endure, shame and suffering. I call it shame always to be considered worthless here and to beg like a vagabond, if necessary, for your means of living, and to be other people’s bedesman, as you are, dear sisters, and to often endure arrogance at times from people who might be your servants. This is the blessed shame I am talking about. Suffering will never fail you. In these two things in which the whole of penitence consists, rejoice and be glad, because instead of these two a twofold joy is prepared for you: instead of shame, honour; instead of suffering, pleasure and rest without end. Isaiah: In terra inquit sua duplicia possidebunt. "They shall," says Isaiah, "have twofold joy in their own country instead of the twofold pain which they endure here" – in their own country, says Isaiah, because just as wicked men do not have a share in heaven, so good men do not have a share in earth. Super epistolam Jacobi: Mali nichil habent in celo; boni vero nichil in terra. In their own country they shall have joy, two kinds of reward instead of two kinds of grief, as if he said, it is no wonder to them that they suffer both shame and sorrow here, as in a strange land and a strange country among unfamiliar people, for so does many a noble man who is a stranger in a strange place. One must labour abroad; at home one can rest. And is he not a foolish knight who seeks rest in the fight and ease in the field of battle? Milicia est vita hominis super terram. "All this life is a battle", as Job bears witness; but after the battle here, if we fight well, honour and rest await us at home in our own country, that is, the kingdom of heaven. The author urges his audience of anchorites to accept pain and humiliation in the eyes of the world as the surest routes to comfort in heaven; whatever you may think of what he's saying, there's no denying he says it beautifully. The difficulty with translating Ancrene Wisse is that it's almost impossible to preserve the wordplay, on which much of the thought-progression turns and builds. This is also part of what makes the text so appealing - something I've been contemplating over the past few weeks, as I try and work out how to convey this to my students. You can take just about any passage from Ancrene Wisse and have fun puzzling out the mechanics of its complex, fluid - on the surface, almost casual - mode of composition. This passage is structured around pairs of words, which appear as synonymous doublets, as complements, or as oppositions: scheome and pine, eadmodnesse and swinc, sar and sorhe, menske and reste. Everything comes in twos, like the twin uprights of the ladder to heaven, as if rung by rung the ladder is being built before our eyes. 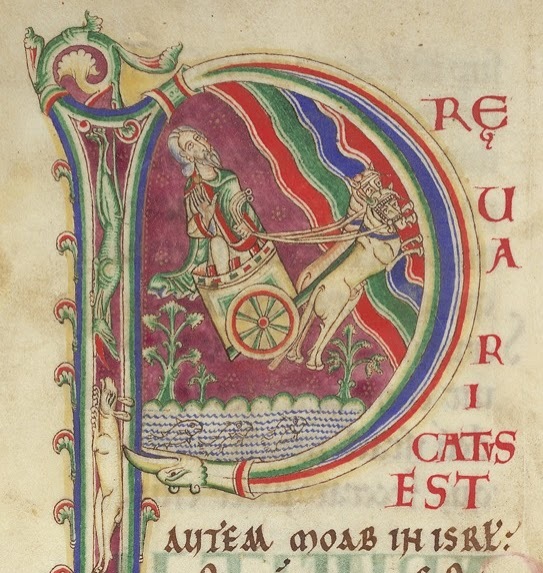 St Bernard's image of the ladder is only sustained for a few sentences, quickly exchanged for another means of reaching heaven - Elijah's chariot of fire - but it's established a pattern of doubles which structures the rest of the passage: the twin wheels of Elijah's chariot, leading into the more abstract twins of twofold suffering on earth, countered with twofold bliss in heaven. 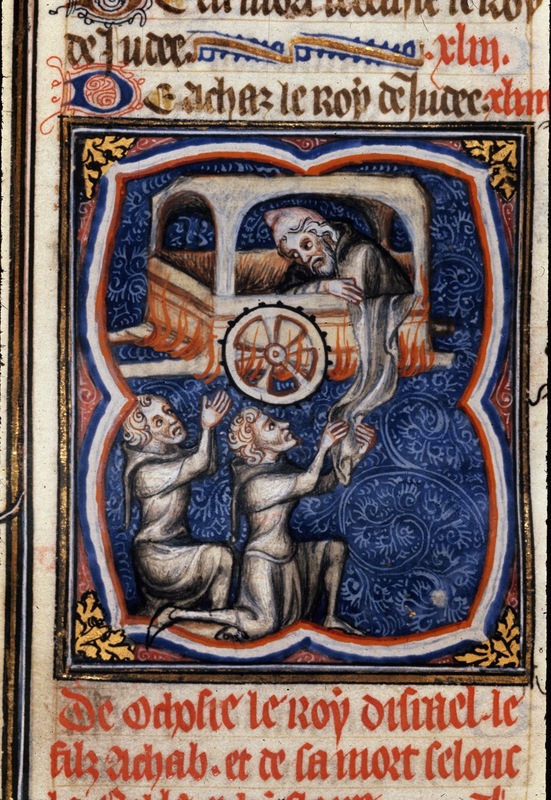 Another lovely bit of wordplay comes in the passage about the wheels of fire which bore Elijah up to heaven (in 2 Kings) and the sword of the angel before the gates of Eden, hweolinde ant turninde abuten, 'wheeling and turning about'. Bodily pain and humiliation are like these fires, hot and red; but they are hweolinde, wheeling round and passing in time, like hweoles because they only last a short hwile. 'Wheeling' doesn't convey 'temporary' as strongly today as it did for our author, for whom hweole and hwile were nearly homophones, and who had probably been brought up on the image of Fortune's wheel - the ultimate symbol of the passing nature of earthly things - from his earliest schooldays. Anything which is hweolinde is by definition both short-lived (and thus, reassuringly, will not have to be endured for long) and earthly, not heavenly, for it's only on earth that things pass away; but there's a kind of paradox in the fact that it's the wheels of this very same temporary, earthly suffering which carries you to heaven, where joy is eternal. 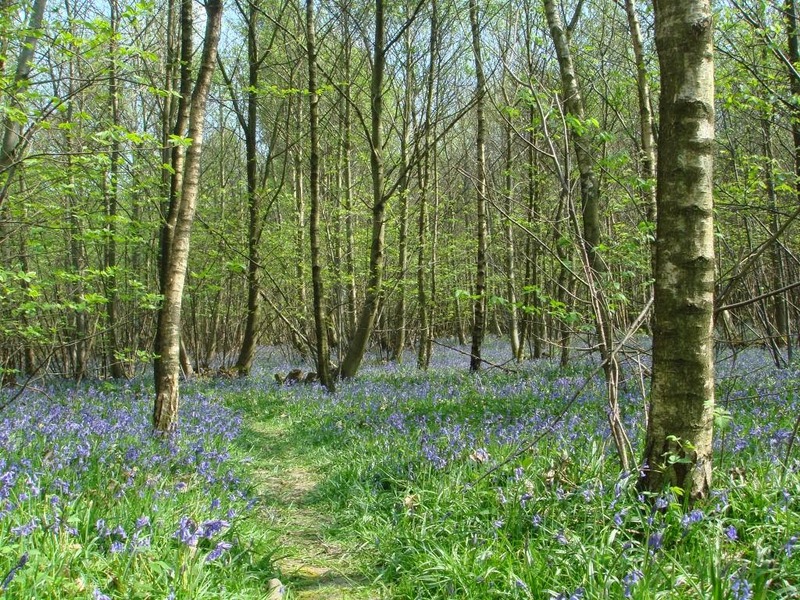 This is 'The Bluebells', by John Masefield, who died on 12 May 1967. At a wood's fence, to look among the trees. In windless noon the burning May-time glowed. Gray, in young green, the beeches stood at ease. Within whose peace no water ever flowed. Tideless was all that mystery of blue. That tears in the heart's anguish answered to. How paint it; how describe? None has the power. 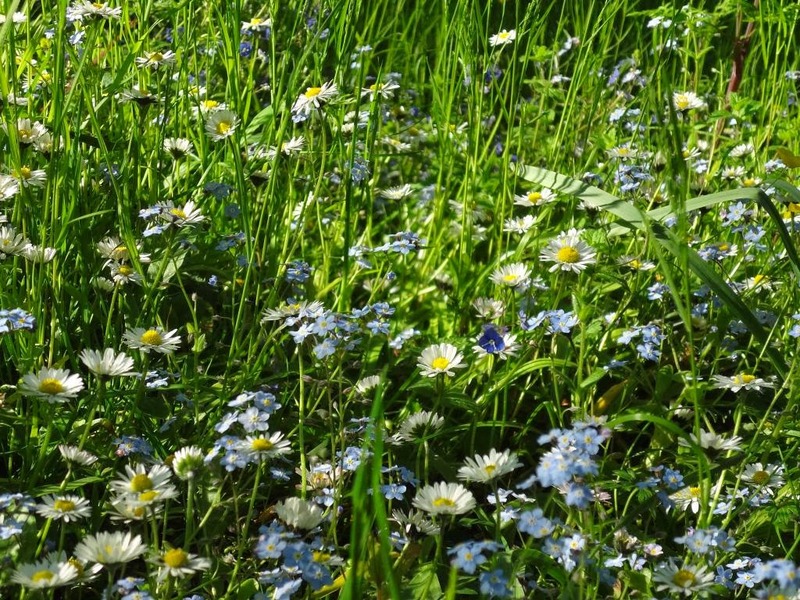 In a green May unutterably blue. And be a balsam upon hearts that bled? To wrest such bounty out of sun and soil? What starved imagination ached to feed? What harassed heart implored for an assoil? What other seer can the beauty thrill? What other passer can be here to see? The new-come night-jar chirring on the branch? 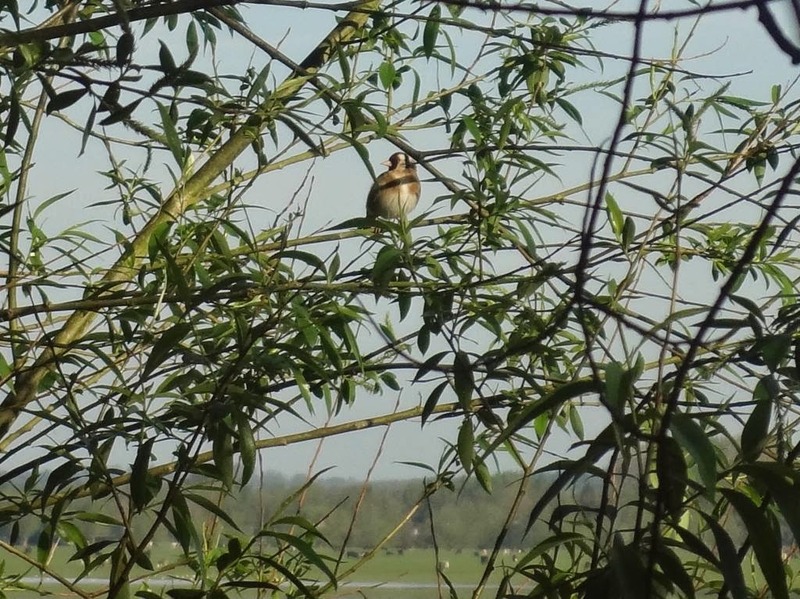 The nightingale exulting in his hymns? The wood-mice flitting where the moon-beams blanch? On which the pale owl like a feather swims? For none of these can such a marvel be. Has it a source in a forgotten scene? Whether to know the Earth or seek the Queen? Is it but yearly gladness of bonds shaken? After a prison, an apparent gate? When the Queen comes and all we dead awaken? 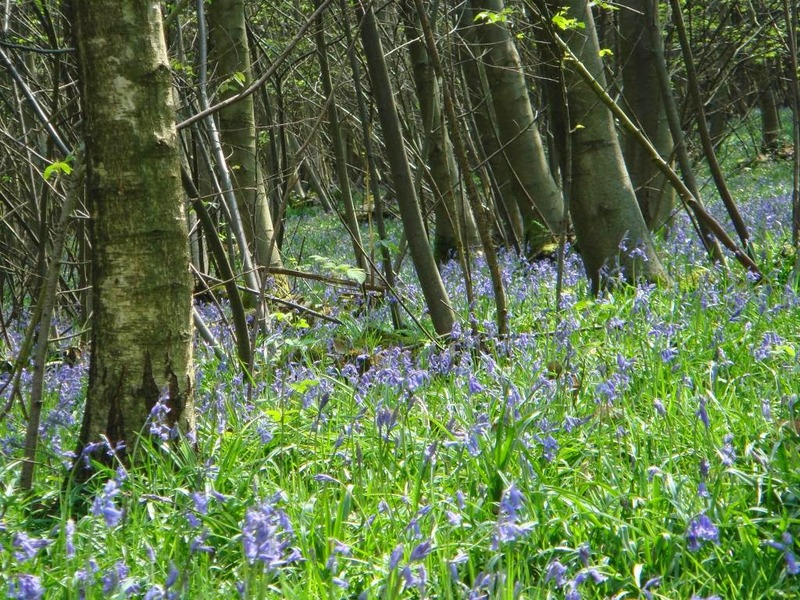 The pictures are of Kentish bluebells - the best kind, of course. I found the poem in The Bluebells and Other Verse, a collection published in 1961; to my surprise (and puzzlement), I found that this book also contains poems by Masefield about Edward the Confessor and, of all things, the medieval legend surrounding the murder of St Ethelbert of Hereford and Ælfthryth of Crowland. Perhaps I shouldn't be so surprised: Masefield was interested in a variety of medieval topics, from Arthurian legend (this is my favourite of his Arthurian poems) to the work of Chaucer, to whom he attributed his 'conversion' to poetry as a teenager; he later wrote "Chaucer was the poet, and the Parliament of Fowls the poem of my conversion. I read the Parliament all through one Sunday afternoon, with the feeling that I had been kept out of my inheritance and had suddenly entered upon it, and had found it a new world of wonder and delight. I had never realized, until then, what poetry could be." And as for the Anglo-Saxons, well, Masefield's 'Sea Fever' is entirely in the spirit of the Old English 'Seafarer' (and even shares one of its kennings: hwælweg, 'whale's way'). The sick and sore who call him as they kneel. All-healing, is Saint Guthlac lying dead. Counted those bones a spirit-saving thing. Angels and men to join to conquer hell . . . The greatest Christian seat in Christendom. But Ethelred, the Eastern King denied. St Guthlac dead should stay where he had died. So great a glory, so supreme a shield. What King in Christendom held holier earth? Of all the structure Offa sought to own. 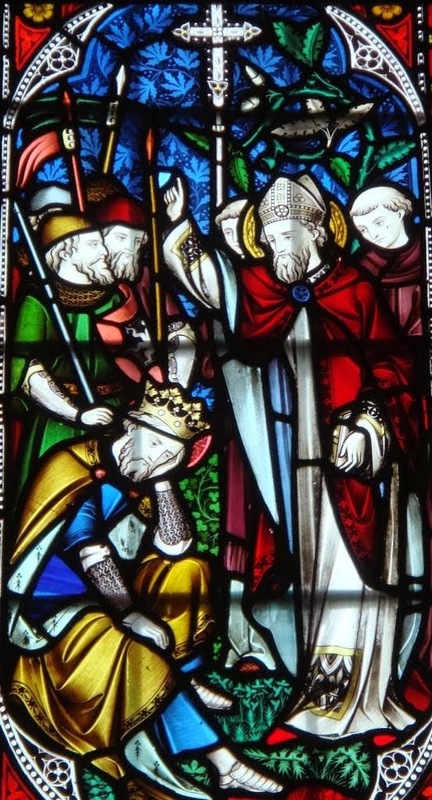 With Guthlac, King and Saint, glory and guard. 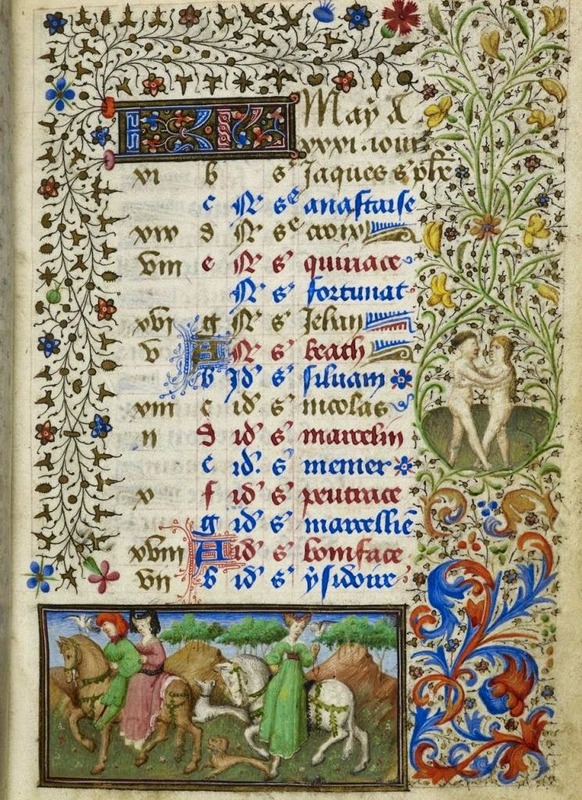 As Chaucer illustrates for us here, May is the month which receives more attention than any other from medieval poets. 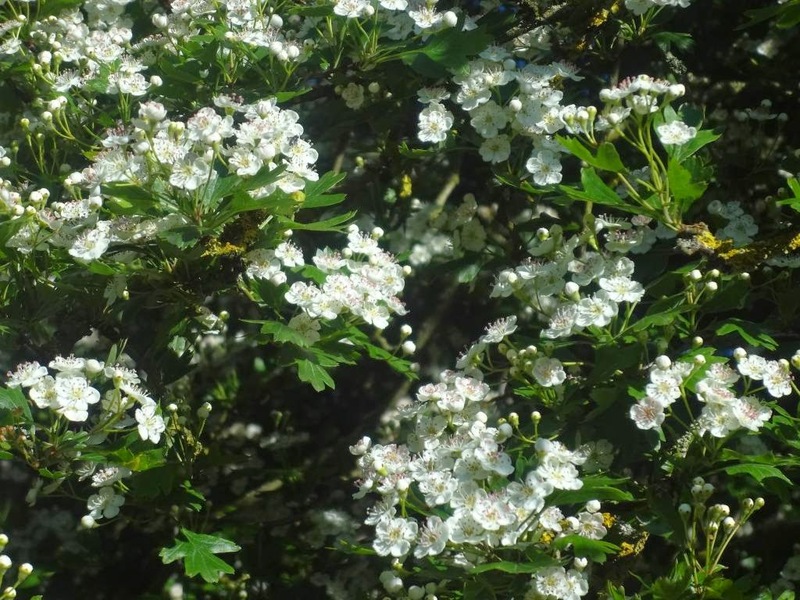 (Not to take anything away from April, with its 'shoures soote', its dew, and its nightingales.) 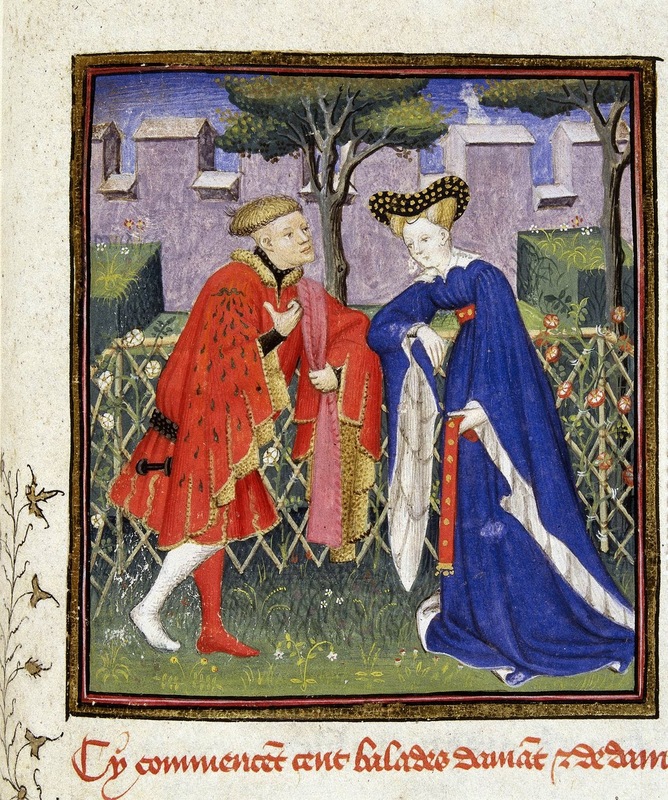 As the month for lovers and for roaming abroad in the countryside, 'the mother of months glad' is a time when all kinds of things can happen, from trysts to dream-visions; so here's a collection of descriptions of May from a range of medieval English sources. A translation of the whole poem can be found here. 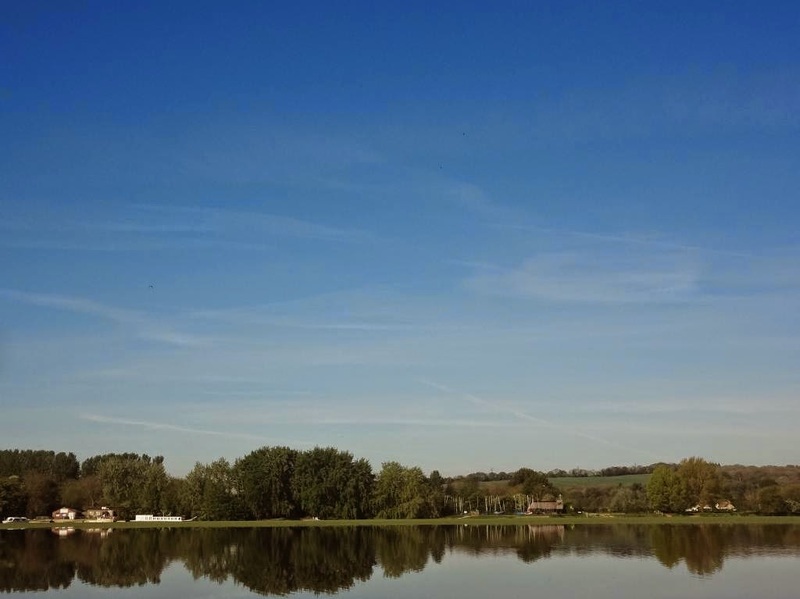 According to the system of reckoning followed in this poem, just as autumn begins on 7 August, winter on 7 November, and spring on 7 February, summer officially begins on 9 May. 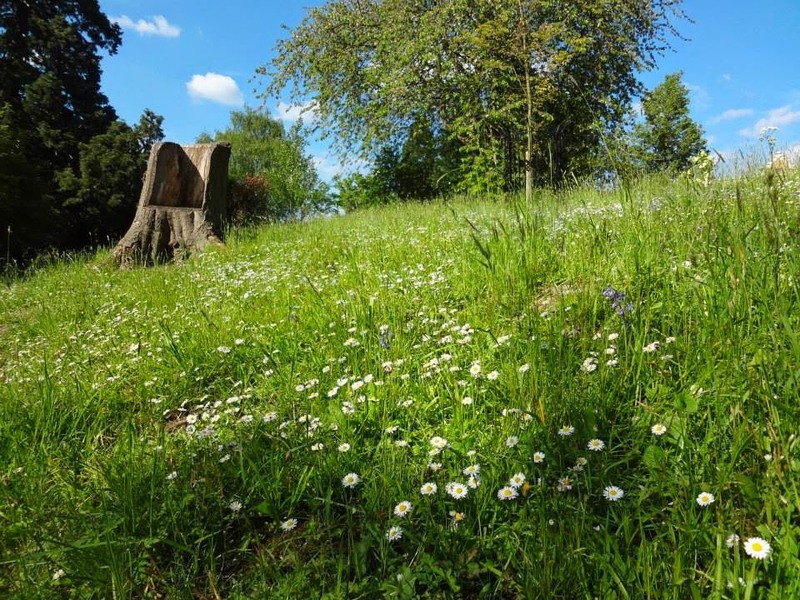 Each of the seasons gets a vivid little pen-portrait, and this is summer's, full of blossom, song and 'sun-bright days, with warm weather' (sigelbeorhte dagas... wearme gewyderu). I love how the last lines of this section evoke the voices of the creatures singing in their many different ways (mænifealdlice) - it's almost as noisy as the cacophony of birds and beasts in 'Sumer is icumen in'. The phrase blostmum blowað, too, could easily slip from the Old English poem to the Middle English song without seeming out of place. 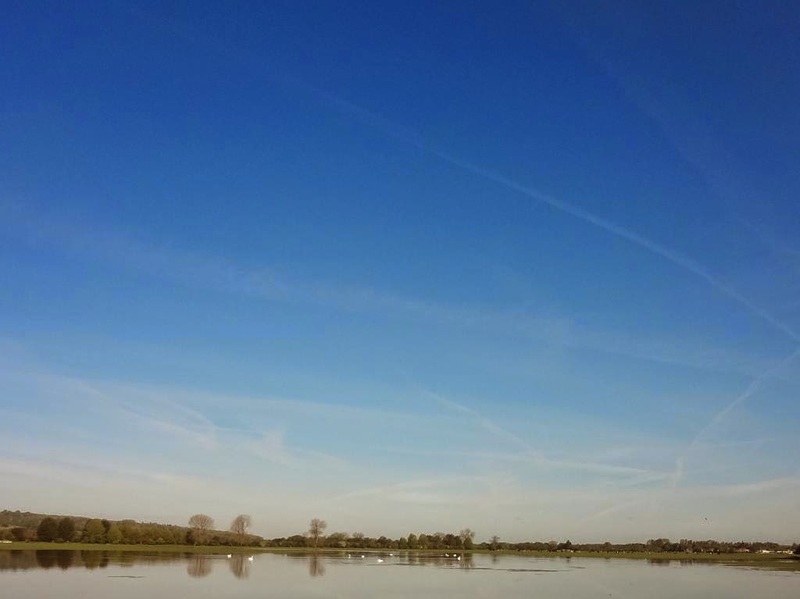 The coming of May is described with the verb scriðan, which seems to mean 'to move smoothly, to glide'; this verb is used in Old English for clouds, ships, heavenly bodies, and for the passage of time, which moves more smoothly than we can track. The whole poem is here (it goes on to tell us that 'women are the best thing/which ever made our high heaven's king/- if many of them were not false'. Hmmm.) 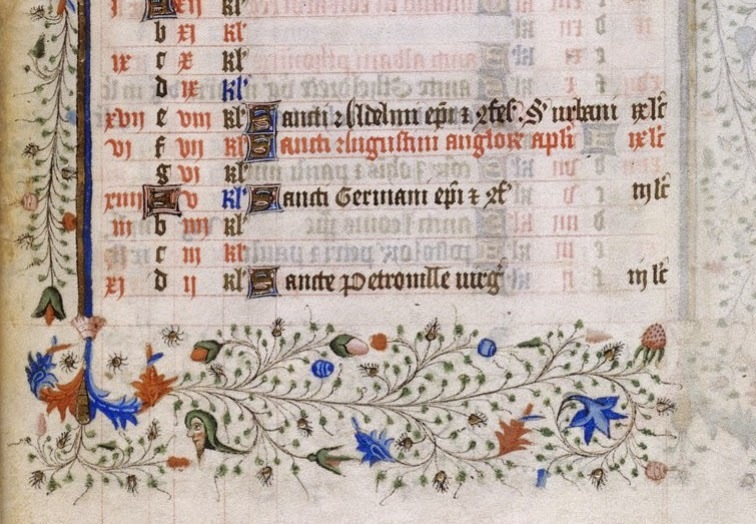 Again, the most interesting words here are the verbs, tokens of all the many things which are happening in May: dawes, plawes, wowes, bredeþ, and most of all murgeþ, which is from mirien, 'to make merry, to please'. You see that May has been 'merry' for a very long time! Farewel my bok and my devocioun! Whan it upryseth erly by the morwe. That blisful sighte softneth al my sorwe. And wonnen that thise wastours with glotonye destruyeth. And to here the foules sing. Fel on slepe opon the grene. Bot lete hir ligge and rest take. That undertide was al y-done. And was reveyd out of hir wit. She is driven nearly mad because she has fallen victim to fairies - more powerful in May than any other month - and, summoned by their king, she must go. The rest of the romance concerns her husband's attempts to bring her back, but nothing will ever be the same again. Meleden ful merye in maner of here kinde. To glade wiþ uch gome þat here gle herde. And thus it passed on from Candlemas until after Easter, that the month of May was come, when every lusty heart beginneth to blossom, and to bring forth fruit; for like as herbs and trees bring forth fruit and flourish in May, in like wise every lusty heart that is in any manner a lover, springeth and flourisheth in lusty deeds. For it giveth unto all lovers courage, that lusty month of May, in something to constrain him to some manner of thing more in that month than in any other month, for divers causes. For then all herbs and trees renew a man and woman, and likewise lovers call again to their mind old gentleness and old service, and many kind deeds that were forgotten by negligence. For like as winter rasure doth alway arase and deface green summer, so fareth it by unstable love in man and woman. For in many persons there is no stability; for we may see all day, for a little blast of winter's rasure, anon we shall deface and lay apart true love for little or nought, that cost much thing; this is no wisdom nor stability, but it is feebleness of nature and great disworship, whosomever useth this. Therefore, like as May month flowereth and flourisheth in many gardens, so in like wise let every man of worship flourish his heart in this world, first unto God, and next unto the joy of them that he promised his faith unto; for there was never worshipful man or worshipful woman, but they loved one better than another; and worship in arms may never be foiled, but first reserve the honour to God, and secondly the quarrel must come of thy lady: and such love I call virtuous love. But nowadays men can not love seven night but they must have all their desires: that love may not endure by reason; for where they be soon accorded and hasty heat, soon it cooleth. Right so fareth love nowadays, soon hot soon cold: this is no stability. But the old love was not so; men and women could love together seven years, and no licours lusts were between them, and then was love, truth, and faithfulness: and lo, in like wise was used love in King Arthur's days. Wherefore I liken love nowadays unto summer and winter; for like as the one is hot and the other cold, so fareth love nowadays; therefore all ye that be lovers call unto your remembrance the month of May, like as did Queen Guenever, for whom I make here a little mention, that while she lived she was a true lover, and therefore she had a good end. What's above him no thought. Down on the wealden clay. To where the lilies are.